Martin St. Louis congratulates his teammates after an overtime victory over the Detroit Red Wings at home by a final score of 4-3. Photo courtesy of MSG Photos. After allowing the Detroit Red Wings (6-3-4) to tie up the game very late in the third period, the Rangers managed to avoid a catastrophic collapse and score on the power play in overtime to give the New York Rangers (6-4-2) a win in their third straight overtime game, with a final score of 4-3. In Alain Vigneault’s 900th carrer game as an NHL head coach, the Rangers were able to earn him a thrilling win at Madison Square Garden. Derick Brassard, one of my players to watch, had another great game tonight, picking up an assist on Rick Nash’s goal and scoring the eventual overtime winner. Brassard’s now has 11 points in 12 games this season. Rick Nash, my other player to watch, scored again, hitting the 10 goal mark just 12 games into the season. Nash scored the first goal of the game, which happened to be a power play goal. Nash has continued to play fantastic every single night. Henrik Lundqvist got his sixth win of the season, making 25 saves on the 28 shots that he faced. Jonas Gustavsson of the Red Wings made 26 saves on 30 shots, as well as some highlight reel stops that kept the game close for the entire game. The game started with the Rangers firing on all cylinders, putting tons of pressure on Gustavsson and the Red Wings. Martin St. Louis nearly scored first, but Gustavsson managed to get a blocker on the puck for a sensational save. When Detroit was on the power play, Rick Nash made a great move following a takeaway and drew a penalty to negate Detroit’s man advantage, which gave New York a short power play of their own. And Nash took advantage of his power play, scoring the first goal of the game. The Rangers did a good job of cycling the puck, and Matt Hunwick got the puck at the blue line and passed it over to Derick Brassard, who fired a slap shot that deflected off of Nash’s backside and into the net. It was Brassard’s sixth assist of the season, and Nash’s 10th goal. Rick Nash celebrates after scoring his 10th goal of the season, and his first goal on the power play. Photo courtesy of MSG Photos. The Rangers continued to bombard the Red Wings with shots, and Anthony Duclair nearly made it a two goal lead when he hit the post on a wrist shot on the power play. The power play for the Rangers was excellent tonight, moving the puck extremely well and scoring twice. It was great to see the power play units, which has been struggling this year, have success for the second game in a row. New York also controlled play in the period, registering the first nine shots on goal and not allowing Detroit to have one until after 10 minutes. Detroit picked up their play later in the period, and Danny DeKeyser nearly tied the game with his slap shot that hit the post, but New York brought their one goal lead into the second period. The second period was where the Red Wings were able to control play for the majority of the 20 minutes. Early in the period, the Red Wings were crashing the net, and Kevin Klein was called for covering the puck in the crease, and the Red Wings were awarded a penalty shot. Gustavo Nyquist took the shot for the Red Wings, but Henrik Lundqvist made a huge save on Nyquist’s quick wrister to keep the Rangers ahead. Henrik Lundqvist stops Gustav Nyquist on the penalty shot after Kevin Klein was whistled for covering the puck in the crease. Photo courtesy of MSG Photos. Shortly after Henrik’s big save, the Martin St. Louis scored on a breakaway to give the Rangers a 2-0 lead. It was St. Louis’ third goal in two games and his fourth of the season. Matt Hunwick made another fantastic pass through the neutral zone to a wide-open Martin St. Louis, who took advantage of a bad change by Detroit and went five-hole on Gustavsson. It was Matt Hunwick’s second assist of the night. Mike Kostka also picked up his first point as a Ranger. Martin St. Louis scored his fourth goal of the season on a breakaway following a great stretch pass from Rangers defenseman Matt Hunwick. Michael Kostka also had an assist, his first point as a Ranger. Photo courtesy of MSG Photos. Detroit would eventually score on one of their many advantages. Jakub Kindl scored his first of the season on a quick wrist shot. The assists went to Riley Sheahan and Johan Franzen. But the Red Wings were not done yet. Daniel Cleary threw a shot on net from a bad angle, and the partially screen Lundqvist let it get past him. Althought he was screened, it’s a puck that needs to be stopped, especially from the angle that Cleary shot it from. The goal tied the game at two. The rest of the period was pretty back and forth, but Rick Nash came close to scoring again off of a rebound, but was robbed by the glove of Gustavsson, and the period ended with both teams tied at two. The third period was relatively quiet, with both teams going back and forth with chances, and both goalies making timely saves. The Rangers would break through first in the period, as Lee Stempniak scored his third goal of the season on a wrist shot that beat Gustavsson glove side and up high. Chris Kreider got the puck to Dominic Moore, who made a quick pass over to Stempniak for the shot. Lee Stempniak scored his third goal of the season in the period, giving the Rangers a 3-2 lead. Photo courtesy of MSG Photos. As time was winding down, Red Wings head coach Mike Babcock decided to pull his goalie with 2:50 left in the third period. After that, St. Louis was called for a hooking penalty and Justin Abdelkader was called for embellishment, making it five on four hockey with the Detroit net empty. Following a good chance in front for Detroit, Marc Staal took a holding penalty, giving the Red Wings a five on three advantage. After bombarding Lundqvist with shots, Thomas Tatar managed to one time the puck past Lundqvist off of a beautiful feed from Andrej Nestrasil, and Detroit tied the game at three with just 7.7 seconds left in regulation, and the game soon went into overtime. In overtime, Martin St. Louis drew a tripping penalty, and Pavel Datsyuk was sent to the box. After Dan Girardi’s slap shot could not be handled by Gustavsson, the puck dribbled out in front of the net and Brassard was there to tap it in, giving the Rangers a 4-3 victory to end their four game homestand. Derick Brassard scored the winning goal in overtime as he tapped in a rebound from a Dan Girardi slap shot, which gave the rangers a 4-3 overtime victory. It was Brassard’s fifth of the season. Photo courtesy of MSG Photos. After two tough losses in the shootout, the Rangers looked like they were headed for a similar fate when they let up a goal with just seven seconds remaining in the third period. But they were able to stay strong and get a win in overtime, ending their short two game skid. The Rangers now have earned at least a point in seven of their last eight games (5-1-2) as well as earning six out of a potential eight points during the homestand. 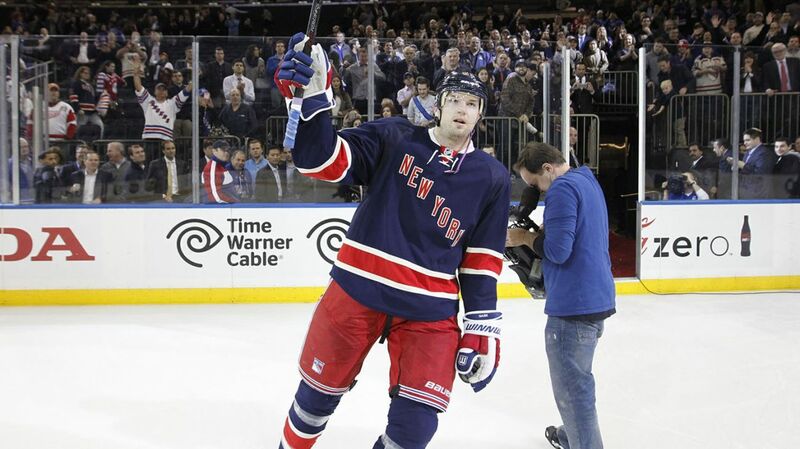 Rick Nash, as he has done all season, was one of the Rangers best skaters. Nash opened the scoring with a power play goal, and was very good on both sides of special teams. He now has 10 goals of the season, and leads the NHL in even strength goals with nine. Nash has just been unstoppable, and the Rangers need to keep feeding the hot hand. Rick Nash continues to stay hot, scoring his 10th goal in just 12 games this season. Nash has also contributed on the penalty kill, and has done a great job using his speed and stick work to draw penalties. Photo courtesy of MSG Photos. Martin St. Louis had his second straight solid game, picking up a goal and an assist. After struggling to score in the early part of the season, moving St. Louis back to his right wing position seems to have help settle the veteran, as he now has three goals in his last two games. Derick Brassard has stepped up in the first line center role and has done a great job. 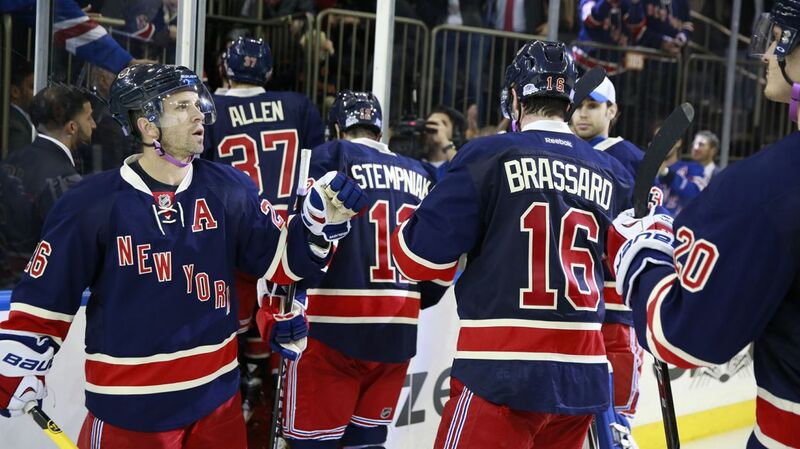 On top of tallying six assists, Brassard also has five goals on the season, which is second on the Rangers. He has improved every area of his game and really helped the Rangers while Derek Stepan has been injured. With all three of these skaters, The Nash-Brassard-St. Louis line has been tremendous the past two games. For the second straight game, all three of them tallied at least a point, and all three of them scored a goal tonight. Even when Stepan returns, it will be hard to break up a line that has been doing so well. It’s time to give Matt Hunwick the credit he so rightfully deserves. Starting the season as the seventh defensemen, Hunwick was quickly given a big role with Dan Boyle’s early injury, and is now playing on the second pairing and logging important minutes. He also had two assists today, making it five for the season, and has shown that he can move the puck effectively and can use his vision to make great passes. Matt Hunwick has done a great job since stepping up to fill in Dan Boyle’s defensive slot, and has also shown how he can move the puck and pass well, which is backed up by his five assists so far. Photo courtesy of MSG Photos. Dan Girardi also logged 30 minutes for the third straight game, and has done a fantastic job anchoring the top pairing for the Rangers. Marc Staal also had just under 30 minutes, and has played some solid defense as well as contributing to the offense. The Rangers power play has been alive and well the past two games, scoring three goals on the man advantage in the past two games. The puck movement is better, the shot selection is better, and the output has been better, which is something the team really needs to compete as the season progresses. The Rangers will have two days off before they travel to Toronto on Saturday to take on the Maple Leafs in another original six matchup. Posted on November 6, 2014, in Game Recaps and tagged Anthony Duclair, Carl Hagelin, Chris Kreider, Chris Mueller, Connor Allen, Dan Girardi, Derek Stepan, Derick Brassard, Detroit Red Wings, Dylan McIlrath, Henrik Lundqvist, John Moore, Kevin Hayes, Kevin Klein, King Henrik, Madison Square Garden, Marc Staal, Martin St. Louis, Mats Zuccarello, Matt Hunwick, Michael Kostka, MSG, New York Rangers, NHL, NHL 2014-2015 Season, NY Rangers, NYR, overtime winner, Rangers Nation, Rangers Season Opener, Rangerstown, Rick Nash, Ryan Malone, Ryan McDonagh, The Duke, The Ranger Zone. Bookmark the permalink. Leave a comment.